Engave your logo on this Maestro Wine Tool Set in Bamboo Gift Box is a premium three-piece wine tool set is to your bar what a conductor is to an orchestra. 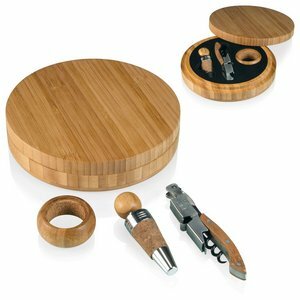 Open the elegant bamboo box to reveal a slide-action waiter-style stainless steel corkscrew with bamboo handle, bamboo drip ring with cork interior, and bottle stopper with bamboo and cork accents. When one's wine tools are in tune with the wine being served, somehow the wine just tastes better.